I have been a proud ipsy subscriber since Jan 2016. After a year of getting monthly surprises in a little bag, I feel comfortable sharing my opinion as a consumer and beauty products enthusiast. Although the company is very new, it has grown consistently since its beginning in 2011. Michelle Phan, one of the most famous You Tubers in the US, is the co-founder and face for the brand. Last time I checked, ipsy had over 1-million subscribers and $120 million annual sales. It’s value proposal is very simple: they have a group of “beauty curators” that will select the best products’ samples for a trending theme. Thus, you will receive five surprise products each month within a beauty little bag, according to your preferences. You visit its website and take a short quiz, in which you give information about your beauty style and brands’ preferences. Once you have a profile and your subscription is activated, you will receive a monthly bag with five products in mostly, deluxe sample size (rarely you will get a full size product). Through social media, you can accumulate points and have access to different “giveaways” for attractive rewards and prizes, like entire beauty collections for a variety of brands. As a subscriber, you also get access to discounts and offers in their website. How does it compare to other subscription boxes? Of course it’s more affordable and targets a younger audience. I think, it is very different from the others in the sense that it’s subscribers are looking for discovery and experimentation and not high-end products with volume and value. I consider my style to be very simple; I am always looking for a more natural outlook to beauty, brands that are vegan, conscious and cruelty free. ipsy has been a sweet discovery; without effort I have got points and rewards. 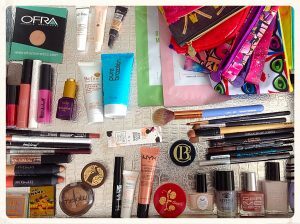 Some of my fav brands are present in most of my bags, like Tarte and Urban Decay. I always get a variety of products that targets my lips, eyes, hair, skin and most of the time a beauty tool, such as a good face or eye brush. Definitely, I will continue my ipsy journey and just for fun, this year I am going to post monthly reviews for my Glam Bags.